CLICK HERE to listen to episode audio (4:27). All Web addresses mentioned were functional as of 4-6-18. From the Cumberland Gap to the Atlantic Ocean, this is Virginia Water Radio for the week of April 9, 2018. This week, we’re focusing on a new, potentially serious insect pest, the Spotted Lanternfly, a member of the insect order of true bugs. It’s not an aquatic species, but its potential effects on many tree species—including maples, oaks, sycamores, and willows—could, in turn, have consequences for watersheds or water bodies near such trees. To learn about this emerging issue, I’m joined by Eric Day, who runs Virginia Tech’s Insect ID Lab in Blacksburg. Eric, welcome to Virginia Water Radio. E.D. : Thank you, Alan. It’s a real pleasure to be here today and speaking about this very important invasive insect. VWR: What’s the origin of the Spotted Lanternfly, and where’s it being found in the United States? E.D. : The origin appears to be northern China, and initially it was found in southeast Pennsylvania in 2014. And we’ve been carefully watching it there because it is emerging as a pest of grapes and peaches, and also of hops. And then now, starting in 2018, it’s been discovered in Virginia. So now we’re starting to gear up our work, gear up fact sheets and other information to deal with the new pest here. VWR: Why is the discovery of it such a concern? E.D. : There’s several issues in the pest status. One is it’s a pest of fruit: tree fruits, the grapes, peaches, and hops I mentioned earlier, also on apples. It’s also a huge nuisance pest, and it is in backyards causing a lot of issues, because it produces a lot of what’s called honeydew, which is this clear, sticky, sugary material, and then sooty mold grows on that, too. So it is a big backyard issue. 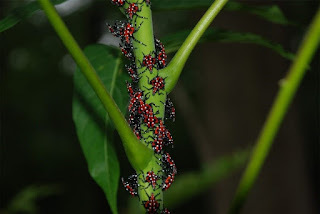 It also feeds on Tree-of-Heaven, which is also known as Ailanthus, which is an invasive species as well, so it [the invasive Spotted Lanternfly] is coupled with another invasive species. Unfortunately, it doesn’t control Ailanthus, it just hitches a ride on Ailanthus and gets its way across the state in that manner. VWR: What actions are federal or state scientists or officials taking in response to the discovery in the States? E.D. : Several things. The state [Virginia] is about to issue a quarantine, so there’ll be quarantines in place where this infestation occurs. In addition, the federal government is going to be doing eradication, combined eradication of Ailanthus and the Spotted Lanternfly. But what we’ve seen, unfortunately, in other states and in other countries, too—it’s invaded in other countries, as well—is the Spotted Lanternfly is very hard to eradicate, because it feeds on a wide range of trees and shrubs. That means it spreads out into the woods and it’s virtually impossible to eradicate. We can slow its spread, much like we’ve done for Gypsy Moth, but ultimately it’s going to establish itself as a pest—yet another thing that farmers and backyard growers will have to deal with. VWR: Well how can listeners identify this insect? E.D. : This is a very easy insect to identify. The name pretty much tells it all. It looks like a tropical moth, with spots on its wings. The immature stages are black, with either white or red spots. So, compare it to pictures on the Internet, and you’ll find it to be a very easy insect to identify. If you think you have it, report it. You can report it to any number of sources: your local Cooperative Extension office, your county office; you can also report it to the Department of Agriculture, either the federal or the state; or the [Virginia] Department of Forestry. All [these] people are aware of this and all [these] people are looking for it. VWR: All right, Eric Day, of the Virginia Tech Insect ID Lab, thank you for visiting Virginia Water Radio to tell us about the Spotted Lanternfly. If you’d like to learn more about this or other insect pests, contact your local Cooperative Extension office. This episode’s interview with Eric Day of the Virginia Tech Insect ID Lab was recorded in Blacksburg on April 5, 2018. Virginia Water Radio thanks Eric for his participation in this episode. Spotted Lanternfly adults (upper photo) and immature stages (lower photo). Photos courtesy of Eric Day, Virginia Tech Insect ID Lab, Blacksburg, Va., accessed online https://ext.vt.edu/spotted-lanternfly. The scientific name of the Spotted Lanternfly is Lycorma delicatula. It was first detected in Virginia on January 10, 2018, in Frederick County, according to the Virginia Cooperative Extension publication, “Spotted Lanternfly in Virginia,” online at https://ext.vt.edu/spotted-lanternfly. Following are excerpts from the U.S. Department of Agriculture/Animal and Plant Health Inspection Service (APHIS), Spotted Lanternfly,” online at https://www.aphis.usda.gov/aphis/resources/pests-diseases/hungry-pests/the-threat/spotted-lanternfly/spotted-lanternfly for USDA-APHIS information. List of “what’s at risk”: almonds, apples, apricots, cherries, grapes, hops, maple trees, nectarines, oak trees, peaches, pine trees, plums, poplar trees, sycamore trees, walnut trees, and willow trees. 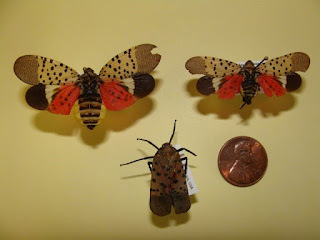 Eric Day, Virginia Tech Insect ID Lab, “Spotted Lanternfly in Virginia,” 2018, online at https://ext.vt.edu/spotted-lanternfly. U.S. Department of Agriculture/Animal and Plant Health Inspection Service (APHIS), “Spotted Lanternfly,” online at https://www.aphis.usda.gov/aphis/resources/pests-diseases/hungry-pests/the-threat/spotted-lanternfly/spotted-lanternfly. APHIS’s November 2014 “Pest Alert” on the Spotted Lanternfly is available online (as a PDF) at https://www.aphis.usda.gov/publications/plant_health/2014/alert_spotted_lanternfly.pdf. All Water Radio episodes are listed by category at the Index link above (http://www.virginiawaterradio.org/p/index.html). See particularly the “Insects” subject category. Following are links to other episodes that discuss non-native, invasive species. EP321 – 6/20/16 – on invasive species generally. EP383 – 8/28/17 – on river stewardship, including washing boating equipment to help prevent spread of aquatic, invasive species. 3.10- impacts on survival of species, including effects of fire, flood, disease, and erosion on organisms.